With the first snowfall last week and Thanksgiving this Thursday, the Holiday Season is finally upon us. The excitement of being surrounded by family and friends gives many a chance to unwind and reconnect, but also opens the door to the stress and pressure of shopping for gifts. From Christmas to Hanukkah and everything in between, Americans love buying Holiday gifts this time of year. Many Americans, in an attempt to save money, will aim to get all of their shopping done on Black Friday. If you plan to get your shopping done on Black Friday, read below for a few tips on how you can outsmart retailers and save money this season. Many companies will mark up their sticker prices just to discount the price and make you feel like you're getting a deal. A $200 TV may get marked up to $300 and then back down to the original $200 with a "33% Off!" sticker. Buy based on your needs, not based on the supposed deals. Some deals - especially deals on electronics - will advertise a huge discount for a product everyone wants. Retailers will keep a limited quantity in stock, knowing that once you come in and they've already run out, you'll stick around and buy other things in the store while you're there. Most Black Friday "deals" will continue throughout the Holiday Season, so you will be able to save money without the craziness of Black Friday. Even with online shopping, prices will likely decrease a few days after Black Friday. If you like planning ahead and making a list, Black Friday can be a great opportunity. However, if you intend to go out and figure things out on the fly, don't feel that Black Friday is the only time to do that. The pressure of "getting it all done" in one day generally causes people to overspend on things they and their families don't need. As with long-term investing, remember to drown out the advertisements and shiny new toys, and focus on what matters. 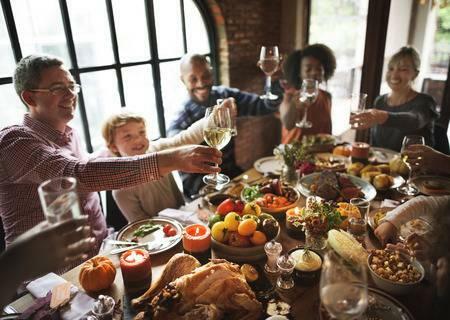 Don't let retailers manipulate you into spending your Thanksgiving thinking about the financial stress of the Holiday Season. Instead, take some of the tips above, relax, and enjoy the time spent with family and friends. Happy Thanksgiving from the Thrive Team!